These fall-inspired Greek Yogurt Parfaits with homemade pumpkin granola and spiced sauteed apples are the perfect healthy make-ahead breakfast or dessert! So much better than McDonald’s! Have you been good all week? Perfect! 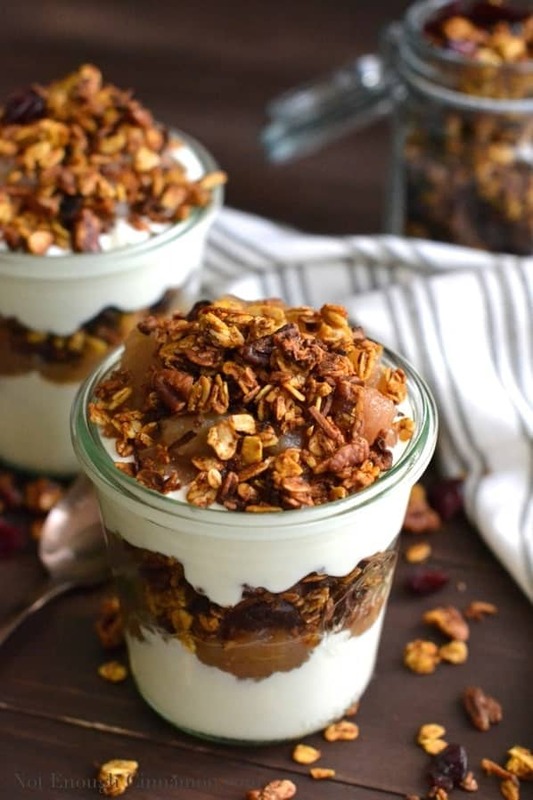 Because now is time to indulge a bit and treat yourself with these Pumpkin Granola and Apple Yogurt Parfaits. If you’re a fan of those little yogurt parfaits from McDonald’s you’re going to LOVE these! It’s Saturday after all, so let’s celebrate the weekend with a special little breakfast treat/dessert! Or whatever you want to celebrate. Just pick a good-enough excuse already, and let’s go to the kitchen to make this healthy fall-inspired yogurt parfaits! These homemade yogurt parfaits combine everything I love about fall. Melt-in-your-mouth sauteed apples sweetened with honey and warming autumn spices like cinnamon, nutmeg and clove and pumpkin purée. Ok, now I feel like a have a double personality issue or something because you all know that I live in Sydney, Australia and in this part of the world…it’s definitely not fall. Try spring instead. 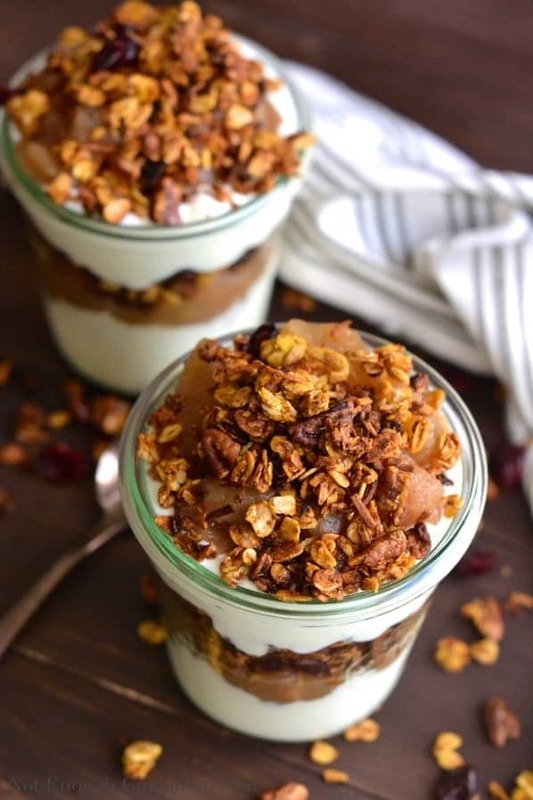 But still, these healthy yogurt parfaits do have everything it takes to be winners in my book, even if it’s not fall-like outside, I was perfectly happy to devour these creamy dreamy Greek Yogurt Parfaits layered with tender apples and crunchy pumpkin granola. I’m not gonna lie, these didn’t last long. The three layers are all delicious by themselves (I had to restrain myself not to eat the whole apples before they got a chance to be used!) but together, they are just perfect! Creamy, fruity, crunchy – breakfast does not get better than this! I love how the Greek yogurt balances the sweetness of the apples and the homemade pumpkin granola, and how the three different textures come together in a glorious harmony once in your mouth. The best thing? You can make them ahead of time and store them in your fridge! Perfect for all you busy working people. Another option is to prep the apples and granola ahead of time and assemble your individual yogurt parfaits in the morning. Either way, these parfaits will put you right into a cozy fall mood. 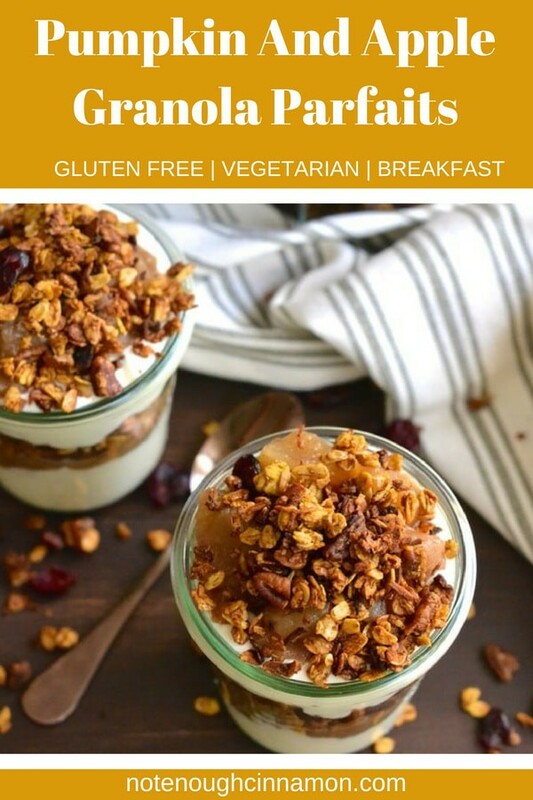 If you tried these Pumpkin Granola and Apple Yogurt Parfaits, don’t forget to rate the recipe below and let me know how it went in the comments – I love hearing from you! You can also follow me on Instagram, Pinterest and Facebook for more deliciousness and behind-the-scenes! 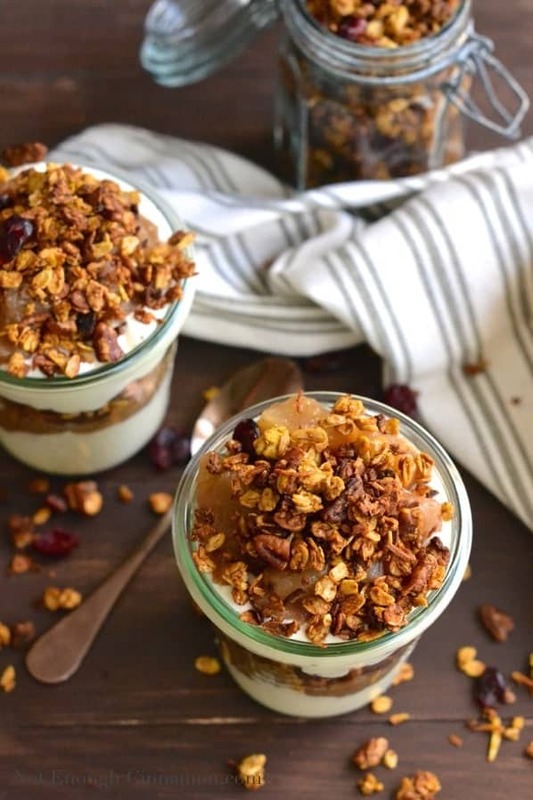 These fall-inspired Greek Yogurt Parfaits with homemade pumpkin granola and spiced soft apples are the perfect healthy make-ahead breakfast or dessert! So much better than McDonald's! Melt coconut oil in a medium pot. Add apples, honey, cinnamon, lemon and mix well. Cover with a lid and cook over low heat for 20 minutes or until apples are very tender. Set aside to cool completely. Preheat oven to 325F/160F. In a large bowl, combine oats, shredded coconut, pecan and spices. Mix together pumpkin puree and maple syrup. Add to dry ingredients and mix well. It's perfectly fine to use your hands at this point, no one is looking. Line two baking sheets with parchment paper or a Silpat and spread oat mixture in a single layer. Bake for 20 minutes. Halfway through baking, take granola out of the oven and stir it (this will allow an even baking and your granola will be crunchy on all sides). When granola is golden, remove from the oven and stir in dried cranberries. Let cool to crisp. Prepare six large serving glasses. In each glass, layer 1/4 cup Greek yogurt, 1/4 cup apple, 1/4 cup granola, 1/4 cup yogurt, 1/4 cup apple and finish with 1/4 granola. Serve immediately. If you are only making the granola, you might want to add more sweetener, depending on your taste. I am sssssooooo going to make this today…..I have been good all week 🙂 looks yummy! Thanks for sharing! Saw this recipe the other day and instantly felt inspired to run into the kitchen and recreate this!!! Modified it a bit and just posted the recipe on my blog (with a link back to yours of course) Loved this granola — especially that is so low in sugar and therefore not too sweet at all! YUM! I love the looks of this!! I need to make this my breakfast soon. Thank you Maryea! 🙂 It would make a yummy breakfast! WOWSER! These look soooo amazing and totally put me in the right mood for fall!